VT Governor James H Douglas proclaimed May 2010 Toxic Injury and Awareness Month in Vermont. http://mcs-america.org/Vermont2010TI.pdf VT Governor Peter Shumlin did the same for May 2011. http://www.mcs-america.org/vermont2011ti.pdf. If anyone bothered to ask we could probably have that every year. As there is no VT MCS community, getting information from others has been hard. We’re an impoverished, rural state. ADA transportation is impossible with MCS (that’s actually illegal under the ADA’s own rules!) so people can’t meet. If you find anything local please contact the webmaster. Vermont Department of Disability, Aging and Independent Living (DAIL): This is the state agency, newly renamed. http://dail.vermont.gov/ The website has no phone number. Vermont has a very large elderly population so funding and focus is for them. Tina D’Amato DO, Charlotte Family Health Center, 802-425-2781, http://www.charlottefamilyhealth.com/about_us.html A generalist with patients with MCS, MCAS, chronic Lyme, Gulf War Syndrome and other “weird” chronic illnesses. She doesn’t specifically treat MCS but if you need a doctor who can write prescriptions, manage your care and knows MCS is real, she can do that. She has many patients with Mast Cell Activation Syndrome, the cause of MCS for many people. She sometimes consults with lawyers for people with MCS and was the physician for the attempt to have a VT HEAL group, a national MCS organization, and paid for all the costs. As she has a lot of MCS patients and studied with a naturopath, she does understand and uses natural medicine. She’s my PCP. She doesn’t write off all your problems to a chronic illness. If you have multiple diagnoses, she’s great. NEW BAD NEWS: Charlotte Family Health Center is EXTREMELY toxic and inflexible in regards to accommodations for people with MCS. Dr D’Amato is not allowed to do phone or Skype appointments, even if you pay out of pocket, so there’s no way to have nontoxic, non-brain fog communication. She cannot even talk to you outside the building. Charlotte Family Health Center staff has no knowledge about MCS or MCAS. We can hope that Charlotte Family Health Center gets with the times and does telemedicine which was meant exactly for rural practices like their own, but it’s unlikely. Takes Medicaid. Thauna Abrin ND, Hardwick, 802-472-9355, http://www.drthauna.com/07/sg.php?home The only doctor who knows how to treat MCS in Vermont. Originally a specialist for younger women’s endocrine troubles, she has MCS herself. She’s known for doing extensive blood work far beyond most NDs. Personally she helped me with MCS, PMDD, and copper toxicity. Her patients call her the “medical detective” and she does not give up. Keep in mind that she is a “one woman show” working with no help. Unfortunately there is no school for Naturopathic Nursing, although it is something we desperately need. Hence, she’s doing everything from billing to contacting pharmacies on top of seeing patients! Sadly for those of us with mobility issues, her office is on a second floor with stairs only, which excludes many people including myself. Once you have established care, she may do phone appointments if you pay out of pocket. Note: As she processes by talking outloud, appointments can be confusing. She often mentions a treatment and begins instructions but then looks up something else, which makes note taking difficult. This is the advice I give people who have problems with her outloud verbal processing: Before the time ends ask for specific directions of what your treatment plan is and write it down. Read it back to her. If she changes something upon hearing that, again read everything back to her. She is an auditory learner. Takes Medicaid. Katharine Guaraldi ND, Stowe Natural Family Wellness, 802-253-2340. She met a patient with MCS in the parking lot. She at least know that MCS exists, but the former patient says she wasn’t helped at all with her MCS. Lyme Disease and MCS In 2015 Vermont was the leading state for the Lyme epidemic and Lyme often causes MCS. 2017: The Lyme epidemic grows as more people diagnosed with fibromyalgia or chronic fatigue syndrome are getting the only accurate Lyme test, by iGenex, which only Medicare covers. The test finds the co-infections that are actually worse than Lyme. Vermont is having tickbourne diseases it “shouldn’t have” and 50% of ticks in Vermont tested had Lyme and/or another disease. Mast Cell Activation Syndrome is often the trigger for MCS if you get Lyme. 2018: Mercy Diagnostics now provides the same tests as iGenex, but for much less, most insurance covers it and the turnaround time for your results is only a week or less!!! This is huge news! iGenex costs $800 while Mercy Labs may cost only $20. It’s the break through we have needed because it is important to understand that MCAS often feels like Lyme disease, especially after a round of heavy antibiotics. Unless we can afford to test for Lyme, we won’t know if it’s still Lyme disease or MCAS. To use Mercy Labs you need to have your blood drawn at a Mercy Labs drawing center – usually a Naturopathic Doctor Office or Dr. D’Amato’s office. This gives you more control over what is wiped on your arm before blood is drawn, a major concern for anyone with MCS or MCAS. The Mercy Diagnostics website should provide you with information about where your nearest drawing centers are. Many Naturopathic Doctors are now studying this, so check with a local ND if you want. It helped me greatly. Dr. Karen Threkel ND in Washington DC 202-244-6661 does this analysis over the phone. You’ll have to see if your insurance will cover any of the appointment. There’s a $250 90 minute intake appointment and then another $80 appointment about the DNA results. She emails reports to you and your doctor. WARNING: Sojourners Center near White River Junction has told me that the owner expressly stated that they are not equipped to work with persons who have MCS. There’s mold and a lot of fragrance. The practitioners I have seen were completely inept when it came to MCS and another Vermont Canary said they provided no help. Eastern States Compounding Pharmacy, Littleton, NH, 800-964-0094, http://easternstatescompounding.com/ Due to sensitivities many medications I need are impossible for me to take. Eastern States does both prescription and over the counter drugs, but with the ingredients tailored specifically for each patient. Both Dr D’Amato and Dr Abrin have used them for various RX treatments I and other patients needed. Eastern States is used by people across the US. The staff and owner are all very aware of the failures of “one size fits all” McMedicine, often due to their own struggles. They mail medication or you may pick it up. They’ll meet you in the parking lot so you won’t have an exposure in their lab. Note: VT Medicaid keeps changing their rules about what they’ll cover made by a compounding pharmacy. Currently (2018), if VT Medicaid no longer paying for ANY medicine. Dr Liscio, Colchester, 802-658-4873, http://www.lisciodental.com/ His own journey led to his cure of MCS by having all his teeth pulled on the advice of a psychic medical intuitive. This does not help most Canaries. His air is purified every 20 minutes and it was an amazingly safe office, but they now use aromatherapy, which is toxic for most people with moderate to severe MCS. He is expensive with no payment plans or sliding scale – For me to have a dead tooth just extracted would cost over $700. He did plan to use nitrous oxide, which for those with impaired methylation detoxification pathways (many people with MCS) is very dangerous. His understanding of MCS is not very good. Brigham Dental Care (low income dental), Morrisville, 802-888-5685. Dr Abrin is able to go here. Elise cleans her teeth. Hard wood floors. Call ahead about the soap in bathroom and ask for it to be fragrance free, as that was her main problem. Someone as sensitive as me would not be able to go there. Lucy McKee, Northern Kingdom Human Services, St Johnsbury, believes her patient that MCS (and ink intolerance) is real and was very effective in helping her with other issues using evidence-based therapies – ones proven to work for most people like CBT, DBT, etc. She’s an addiction counsellor like most mental health providers in Vermont. Her private practice office has become safer, but there are stairs. 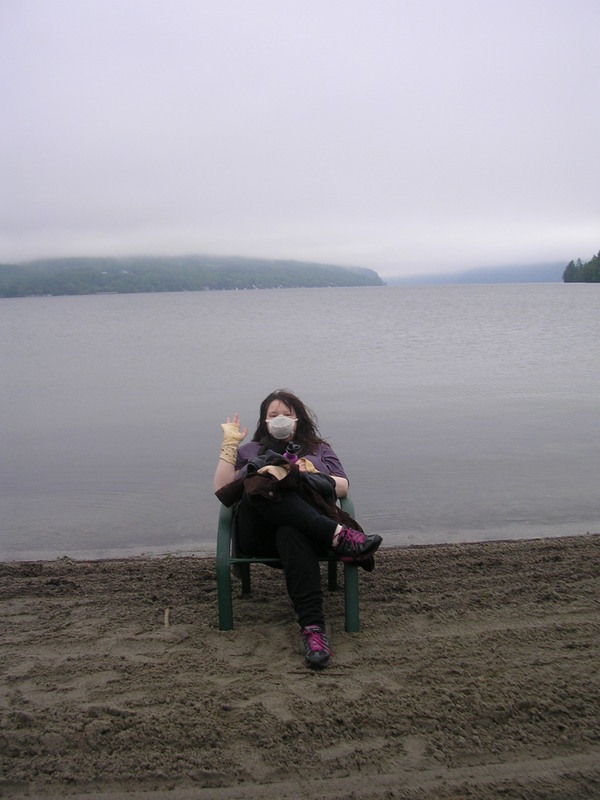 (Moderate MCS sufferer wears a mask which works for her.) She will call in advance to cancel if the last patient filled the room with fragrance for your protection. She does a walking appointment with one MCS sufferer. 2018: Educating other therapists about MCS. We need more therapists like her! Dr Joe Lasek, Psychiatrist. Works out of Burlington’s horrid Community Health Center and at the Howard Center. Organized the 2018 Mast Cell Activation Syndrome conference at University of Vermont. He may know of other mental health care providers who attended the conference. He may not know much about MCS. He is committed to helping people get off unnecessary medication and is the most caring psychiatrist I’ve met. As he knows about MCAS, he should know about medication sensitivities and allergies, and help you find which generic version works for you (every pharmacy carries different manufacturers) or have Eastern States Compounding Pharmacy tailor make a version for you. Unfortunately the Howard Center is very toxic. He knows that MCAS causes brain fog and mood swings, but doesn’t work anywhere that will not trigger them. At the Community Health Center I think he may just oversee the work of a Nurse Practitioner and rarely interacts with patients. Chittenden County VNA (Leslie Parker) and Caledonia Home Health (Pat McNichols) and Northeast Kingdom VNA (Julie Bigelo) have provided services to persons with MCS. However, I find it much better for someone with MCS to choose the Flexible Choice program, managed by Transitions II, of Choices for Care Medicaid Long Term Care. This program provides some financial assistance with home help attendants for shopping, cleaning, cooking, bathing, etc. If you have a family member or friend already doing this, you could hire them. I am in this program due to MCS. I fought hard for that against my Caledonia Home Health Care lazy case manager, who repeatedly hung up on me. The state said I qualified for the program and she said there was no way to work with me. I had to threaten legal action to make them do their jobs. One 22 page document about how if they didn’t work with me to find solutions they’d lose their funding because they’d be breaking the Americans with Disabilities Act and hey, she pretended to like me and took my calls! I never trusted her after that with good reason. The precedent has been set so all Choices for Care Medicaid agencies in Vermont have no excuse – It is your right to be accommodated. Chittenden County hired a person who is fragrance free and Calendonia Home Health Care had staff wear the Tyvek suits Dupont 1414 which they bought. Personally I think the Flexible Choice (managed by Transitions II) of Choices for Care version suits those with MCS better. The director Michelle Brennan knows about MCS and MCAS because of me and the nurse, Tracey, who does my evaluations is incredibly respectful about MCS. This version of the program also allows you do spend some of your budget on medical supplies like air purifiers, medical testing, and (currently) supplements. Also, because I can’t have a printer due to ink intolerance, they print my receipts from companies who don’t mail them, only email them. That’s quality service! It’s also an example of how easy it could be for ANY agency to accommodate someone with MCS/MCAS. Remember: If an organization receives government funding they must follow the Americans with Disabilities Act. Sensitivities and intolerances are NOT the same as allergies. Allergies are not considered a disability. Sensitivities and intolerances are! Most expect you to not know your rights – most don’t even know what the ADA is! Use it like a battering ram to get access to your rights! The Choices for Care program decides if you require home health with shopping, cleaning and personal care and then pays for it. To make the money go around, even if you qualify for 6 hours help a week, you will receive only 2. (So don’t get excited when you get a letter from Medicaid saying 6 hours.) If your needs are deemed more serious, you get more hours. At the least the person can do errands for you, going to toxic places like the post office, grocery store and pharmacy. Although they try to accommodate persons with MCS most of the people who clean, shop, cook etc smoke or reek of perfume. If your program allows you to find your own employees (like Transitions II), finding a nontoxic home health aid is hard – We hang flyers at farmer’s markets, co-ops, solar shops, etc. There are many persons with mild MCS who need work. Those who by choice live chemical free (making their own skin lotion and toothpaste like we do) take a shower at my home and wear organic clothing I provide and wash. We’ve had some luck with aides who don’t use make up, fabric softener or perfume wearing Tyvek suits. (See Resources.) Bald men due to the lack of shampoo are usually less toxic. If you have any medications that may stolen for recreational use, put in a lock box. Rural Edge formerly Gilman housing – Low income and disability housing for the Northeast Kingdom. There are very few non-smoking unit available, which is rather shocking for disability housing. Think of the people with cancer, asthma, etc! They have dealt with at three persons with severe MCS. They will buy Denny Foil, Shur Tape, use no VOC paints and make other accommodations and modifications where they can. If they can do this then all other government funded agencies have no excuse and could lose funding for violating the ADA. Dr Grace Ziem’s website has a list of MCS reasonable accommodations and modifications in case an agency asks. Dr Abrin is well known for working with her patients and agencies to get MCS needs met. Please note: Not all employees/volunteers will know about MCS. Vermont Center for Independent Living – 800-639-1522. http://www.vcil.org/ Traditionally CILs and persons with MCS have very different goals. CILs want to help disabled persons participate more in the mainstream while those with MCS are looking for safety from the mainstream. I have yet to hear of a CIL that is even fragrance free. However, sometimes VCIL has funds for helping people buy adaptive technology. Two persons with MCS I know had air purifiers bought for them, one paying 20% of the total cost. The funds traditionally come in October. The funds run out fast! RewardingWork.org Call Vermont Center of Independent Living for the access code. 800-639-1522. You can view people searching for work. There’s a box they check if they will use unscented products. Email them what that means for you, and it’s really fragrance free. Unscented means chemicals mask the fragrance. Community College of Vermont http://ccv.edu/find/ If you have a flyer about what you need from a home care provider, your local campus will hand it in the library/lounge. Nurses, LNAs, etc go there for continuing education and certification training programs. Many need more work as their hours get cut at hospitals. Episcopal St Peters Lyndonville. Until recently had a Priest with moderate MCS who at times attended in the back row wearing her mask. They put in new air purification, but it’s still difficult. A Priest brings Communion to the house of someone with moderate MCS. Unitarian Universalist Burlington. They have begun educating people about fragrance. Last I heard they were hanging signs that the church was fragrance free and why. Purple Shutter Herbs, Winooski, 888-865-HERB, http://www.purpleshutter.com. Bulk herbs and herbal products. Fletcher Free Library, Burlington. Wisdom of the Herbs School East Calais, VT, 802-456-8122. The teacher is well informed about MCS and EHS. No one admits they discriminated, so you need witnesses, written statements, recordings of VM and conversations and/or photographs. Disability Rights Vermont, (Formerly known as VT Disability Protection and Advocacy.) http://www.disabilityrightsvt.org/ 1-800-834-7890 or 802-229-1355. They can help you find resources. I used them twice and once they sent me to Human Rights Commission and another time gave me a website for finding a social worker which didn’t help. Vermont Human Rights Commission http://hrc.vermont.gov/ 800-416-2010 (voice) 802-828-2481 (fax) 877-294-9200 (TTY) Health Care Advocacy’s Vermont Legal Aid program 1-800-917-7787 (Formerly known has Omsbudman; the part that handles Choices for Care is still known as Omsbudman.) This independent organization helped me with this Medicaid problem: Medicaid will not pay for counseling over the phone but my ADA recognized disability of MCS means I cannot leave my room or have anyone visit. Medicaid is not meeting my ‘special needs.’ For legal help with health care issues, contact them and they send you to a lawyer at Legal Aid. The few people I know with children who have MCS home school and usually have to do it completely alone, without the help of other homeschoolers. I wish there was a resource for parents with MCS in VT. Carol Westinghouse (above, under educators) works fulltime educating schools and day cares, yet she knows of no parents’ group against toxic environments. Maybe the American parenting groups on the Resources page will have ideas and support. I have seen that sometimes children on organic farms often are safe playmates for children with moderate MCS. Check at farmers markets if any know about MCS. Children with Lyme often have MCS. Also children with other “special needs” who are alienated may have parents more open minded who will help your children have playdates. I’ve seen that. I have heard there are local, online “mindful parenting” groups but am not sure what they are. Flyers at the local co-op, health food store, naturopathic center, farmer’s market, solar sustainability supplies shop, etc. may connect you with supportive parents, friends for your child and perhaps a homeschool team. As always in Vermont, be prepared to drive a long distance. I grew up in a small Vermont town and the nearest pediatrist was almost an hour away! Hence I had terrible health care. If you have MCS, the way you live will help any of your children who may develop MCS, asthma, autism, etc., perhaps even preventing those problems. Pregnant women and homes with small children are being told by mainstream doctors to live as if they have mild MCS for the sake of the child. If your children see you advocating for yourself and their needs, they will learn how to advocate for themselves. MCS does appear to have a genetic component. There are signs and brochures about MCS and fragrance on the Resources page that you can download. If you remember when you go out (brain fog) or have real friends, supportive family or hired help, ask them put the brochures in co-ops, farmer’s markets, smart doctor’s offices, church/temple bulletin boards, parenting groups, libraries, town meetings, community centers, other chronic illness support groups, and ask people to display them at their booths at Green Expos and Natural Health Expos etc. By connecting with allies of nontoxic living and disability rights, we can mutually support each other and have strength in numbers. If you like me are ink intolerant, you can have someone else make the copies and fold them, or go outside and with mask on to fold them, and keep them in a metal cashier’s box or small tool chest or several older off gas freezer bags. Also you can often email the pdfs to a large copy center like Kinko’s or Montpelier’s own Capitol Copy and they will mail them back, already folded. Sometimes a local business will donate $20 to have their business card be on the brochure if their products or goals match our issues, like home schooling supply stores, eco-salons, health food stores, organic farms, wellness centers, etc. With a few sponsors you can make hundreds of brochures. If we do not do this no one will. No one has ever handed an oppressed minority their freedom and rights. Ask your church, support group, chiropractor, peace and justice center, yoga studio, meditation center, community centers, afterschool programs, town meetings, co-op, and anywhere else you wish you could attend to become fragrance free and hang a sign on their doors and post that information on their website and literature. It is very common practice in other regions of the US already for the safety of staff and customers. The more people see the letters MCS the easier life may be for us someday. Email or phone “community events” to explain that you would have spent $300 on their weekend workshop but they allow neuro-toxic substances and endocrine disrupters in their room. Many parents are concerned about their children’s exposures to toxic substances. This is a group that is happy to learn about how to live a non toxic life – and as cheaply as possible. We can fill that need. This is a huge potential alliance. For a brief time, the Vermont Canaries were an active group, led by Ishana Ingerman. One meeting included John Berino who is the Manager of Occupational and Environmental Health at Fletcher Allen Hospital. President Ingerman worked to make Fletcher Free Library in Burlington fragrance free. This webiste is a result of that group, in a strange way. They asked me in month 2 of my diagnosis to run for president which was a bad sign that any enthusiasm the group had was gone. (Very common with any chronic illness organization, especially if they start with too grand of plans and see no results.) I wrote a formal proposal to create their website, which they rejected and told me what they wanted instead. What they wanted was exactly what my proposal was, but none of them had even read the asked-for proposal. The group disbanded soon after and I built this. I learned from Carol Westinghouse that there was an earlier group that disbanded for the same reasons: Where can we safety meet? How can we safely attend? Who will be well enough to lead? Ms Ingerman had a chance for speaking on the news but there was nowhere safe for her to be filmed. Leaders burn out and if there are no other members invested in the success of the group, the group already fails. In hopes that one day there will be more interested, solid, supportive, active members, I have gathered what information I could about MCS and VT for future VT MCS groups, in whatever form they may take. Those with MCS have a debt of gratitude to Ishana Ingerman and Carol Westinghouse, plus the others working without public knowledge. Thank you to all of you, H. Awen! Thinking of Moving to Vermont? Think more. Dr Abrin advises clients in California, the Southwest, etc not to move here. The main reasons are mold and wood stoves. Almost all housing has mold. If you weren’t mold sensitive already, Vermont might make that a new problem. These are old buildings in an impoverished state. Vermont like all of the Northeastern US is in a Lyme Disease epidemic. Hunters are now encouraged to have their doctor give them amoxicillin before they enter the woods and to take the antibiotic if bit by a tic asap. Half the children of my friends here have Lyme. Since Lyme is mutating the tests are not very accurate. Many people who thought they had fibromyalgia are learning it is undiagnosed chronic Lyme. (Lyme like malaria is chronic.) This is one of the many challenges to being outside in Vermont. If you have chronic Lyme there are a few good doctors (MDs and NDs) who use the old antibiotics and treat the resulting Candida while having patients change diets and sometimes take other immune supplements. However, most doctors still don’t believe in chronic Lyme. Also hayfever and seasonal allergies are a problem for most people here. Tree pollen and ragweed is abundant. We also have a lot of deer flies, horse flies and mosquitoes. There are a few rattlesnakes near Fair Haven (Abenaki call it Snake Mountain) but no other dangerous snakes. The spiders to watch for are the Brown Recluse and Black Widow. Growing up here I was bit by a lot of spiders. Wood smoke was the bane of my childhood in Vermont when my MCS was mild. You cannot get away from wood stove smoke in Vermont. This means you won’t go outside in a state whose main selling point is nature. People still illegally have burn barrels where they burn plastics because they cannot afford going to the dump. Also this is an agricultural state and so there are pesticides. The indigenous Abenaki wisely used the vast amount of fresh water -the lakes, bogs, marshes, rivers – but now many fresh water places have pesticide run off (endocrine disruptors) and oil spills on shore from boats. There is still a lot of logging which means remote areas have deisel fumes. Being such a small population (600,000 people in the state) most roads are treated like highways, with a lot of trucks. “Back roads” are usually Class Four and will destroy most cars. The main source of income is tourism because Vermont is beautiful. That traffic and need to do constant upkeep on roads, along with logging and the general infrastructure, means remote places are usually populated or being repaved. Politically, yes, Bernie Sanders is a socialist even though he says he is an “independent.” However with him in US Congress, he doesn’t have very much to do with Vermont anymore. Even though he on a national level has fought for MCS related issues like Gulf War Syndrome, he doesn’t affect Vermont. Vermont has the second highest average age, just behind Maine. The state is filled with an aging population and if you are coming from Portland, Toronto, or even Omaha, you may be surprised at how… 1980s the left is politically. There appear to be online many Transition Towns but in reality not so much. Don’t be fooled by the Internet. Depending on where you move, expect a 3-7 year wait for subsidized housing. Many Section 8 housing lists are too full to even take new applicants. Vermont has a lot of elders in need of housing and many young veterans. As a poor state many young men were in the National Guard and ended up in wars they did not expect or even support in the case of those veterans I know. Also it’s hard to find young, healthy people to do any home health work. The youth population is small and most are in one of the many Vermont colleges, which takes wealthy parents for the out of state students who come to major in snowboarding. Renting can be problematic if you don’t want keg parties and a meth lab above you as most rentals are for students. Also lead paint still is often an issue. Be prepared for mud bog races. Vermont’s number one problem according to politicians and the media is (still) heroin and opiate addiction. Like any rural area we do have our meth labs (the Quebec biker gangs are infamous for that). But today doctors are very wary to write any opiate RX, even if you move here with medical records and have been on them for years. Gangs from the Bronx have divided parts of Rutland for drug selling and turf wars do occur. If you think your children will be safe from drugs and violence, you’re very wrong. Alcoholism rates are high here as are 12 step meetings, typical in a lonely place with long dark winters. DUIs and alcohol-related domestic violence comes with that. Due to the low population, lack of safe transportation, and nowhere safe to meet in person, organizing MCS meetings in person has proven to be very difficult. Many activists have ties with ABILITY MAINE, the largest northern New England disability organization. I personally really like them and their radical the personal-is-political stance. You may have to rent a PO box, hire a person with a snow plough all winter, and take trips to the dump as well as the recylcing center because many towns’ services do not include those things. Many people leave after one or two of our very dark, isolating winters. (If you have SAD get a lamp now unless the EMFs hurt you.) This is a great state for introverts. I joke that “Vermont is for loners.” By percentage Vermont is the whitest state in the nation. Vermonters are often proud of not being racist but they usually only know other white people. Persons of color I know, especially men, are pulled over by police constantly. I have seen Confederate flags in rural areas (one home with two state trooper cars is the most notable) but that may due to their service in Vietnam, yet I doubt it. Gay marriage is legal here, but that doesn’t mean everyone agrees with that. Places do discriminate. Establishments owned by conservative Catholics often won’t hold gay wedding receptions. Also all young gay people I have met go to Montreal just to dance and hope to get into an out of state college so they can date. The state doesn’t have one gay bar or cafe. This is Puritan New England, don’t forget. As a state with an older population, youth culture is nonexistent and even worse for young gay people. My classic Vermont classism moment was when after Irene destroyed the state and 1 in 5 Vermont children were suffering from hunger, in the most impoverished region of Vermont the older liberals had a big fundraiser… for Nepal. The state has a severe doctor shortage so expect to be on a wait list for 6 months to a year before you can even see a doctor. Some turn away anyone with chronic illness. There is a lot of “alternative” medicine here but that doesn’t mean the people are very good at it. It also is part of the class divide. If you are interested in 1980s New Age spirituality, there are many people who will take your money. There are probably more terrible Reiki Masters and shamans here than anywhere else. Sadly if you want another type of energy work, acupressure as opposed to acupuncture, or to stay away from cultural stealing, it’s very hard. We do have a lot of good chiropractors if you can tolerate their offices. (I can’t.) Vermont has the lowest standards about who can be a therapist. If you want to see someone who practices evidence-based psychology (things proven to work like mindfulness, DBT, ACT, etc) you’ll probably have to be in Chittenden County. You will need a car (or truck) with snow tires. Even in Burlington the public transportation is terrible, especially in the “ethnic area” “working class” the Old North End. (I had a friend from Senegal who had to ride his bicycle in 20 below when he got off work. That the poorest part ofthe city had the least bus coverage is a statement about how Burlington caters to college students.) Burlington is famous for its urban sprawl so be prepared for a lot of traffic, one way streets, and sudden highways. Going north-south is easy on highways but crossing the state is harder and takes more time than you may think. The Green Mountains are old and thus not very tall, but they do present problems like white outs and lots of curvy roads. Boston is about three hours south and Montreal is about three hours north. Trucks go through Vermont to those cities. Burlington has a small airport. Now that I’ve scared you with reality, I can say what Vermont does have. If you are on SSI, Vermont adds a little so you get a whopping $740 a month. Naturopathic doctors are covered by Medicaid but their supplements are not. Dartmouth in New Hampshrine and Flecther Allen in Burlington are both well respected hospitals although Fletcher Allen has a higher than usual post-operation infection rate. (Fletcher Allen appearsto be changing its name.) Neither believe in MCS. The VA is in White River Junction. The state has organic medicinal marijuana MMJ, with centers in Chittenden County (Burlington area), Montpelier and one other place, possibly Rutland. Unless you live in those towns you might be making a two hour drive. If you are on Medicaid you get a 10% discount. Every year you’ll need to pay $50 to register and have a doctor renew your prescription. I was concerned and wary, but the dispensary was very helpful and I found a strain that eased my insomnia far better than Valium. They have mastered this science. Different strains help with different problems. I obviously eat it, cooked into coconut oil which can be baked into bread, added to meat or put on english muffins. I have very few food and herbs I can tolerate and even though hemp fabric or people with the smoke in their hair causes a reaction in me, MMJ doesn’t. Vermont has a lot of local organic farms and farmer’s markets are real money savers. Sadly they often have BBQs there, making the air intolerable. The state is known for small dairy farms. If you want to be a locavore and eat grass fed, free range, organic etc dairy and meat, this is a good place. Co-ops can often help you contact the farmers and ask about the nutritious rarities others don’t want like organic liver, chicken feet and beef heart, which may be free. Some give away the bones for making soup stock. Also there are places to buy raw milk here even though it is illegal. Co-ops can order foods for you. Aside from Montpelier and Burlington the health food stores themselves are small, with a much smaller herbal medicine selection than most. We have nothing like those giant Whole Foods here. (The state doesn’t even have a Target.) Vermont also passed the GMO labeling bill. Gardening is a big hobby here, although the soil is often better for raising goats than veggies. Kale and related vegetables tend to grow well. The growing season tends to be short. When I was a child growing tomatoes was hard, but now that it is warmer, people have better luck. With Climate Chaos, summers have become much more humid and thunderstorms more common, so root veggies have been rotting and hay has begun to be imported which is highly unusual. Most gardeners I know now grow different foods that thrive in different climates, hoping something turns out well. Keeping chickens and goats is very common. I grew up with both. I’ve seen chickens in Burlington although I don’t know if it was legal. The Northeast Kingdom (NEK) is the most impoverished and conservative area in the state. I live there and have found that many people here have MCS but don’t call it that. Farmers, mechanics, veterans and people who work at ski resorts often have MCS (and TBIs). My mask and the words “chemical injury” actually cause sympathetic understanding with many blue collar people. I’ve found that many mothers are aware of MCS. Vermonters bond on hating the telephone provider, Fair Point. Vermont doesn’t have a population to make it worth servicing, so rumor has it that when Ma Bell fell apart Fair Point was forced to take Vermont. Fair Point may be better now, although their workers currently are on strike. Cell phones and GPS work in most places although the NEK has terrible reception in some places which may good news for those with EMF issues. The population is far too low to make cell towers worth it. I personally like that. A lot of people have solar panels and live semi-off the grid and many like my mother until recently live completely off the grid, so if that’s your lifeway, you will find many resources if you have the money. I grew up that way for a while and loved it. I was sick whenever I went to school and when we lived in other places because I had MCS even then, so living in a tent bathing with Dr Bronners in a stream away from traffic and other people’s chemicals worked for me. However the woodstove and oil lanterns for light did bother me. Winters in Vermont are the only place where my vasomotor rhinusitis (nonallergic runny nose, post nasal drip, sinus headaches, etc) never stops. Vasomotor rhinusitis is now known to be caused by irritation from chemicals, smoke and hormonal changes, often called an occupational illness. My most famous allergist said it tends to affect women who grew up farmlands the most, a place of endocrine disrupting pesticides. I’ve noticed many with MCS have it and consider it an Environmental Illness because the only treatment is avoidance. Vermont 101 by me is finished, LOL.